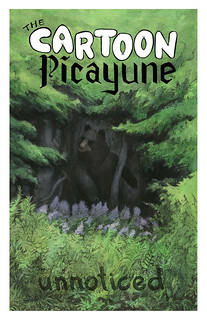 Here as I put together the first issues of The Cartoon Picayune, I am struggling to establish standards of quality, style, and ethics. One of those things I can't really make up my mind about is the appropriateness of first person. I don't want my anthology to just be a venue for autobiographical comics, but I realize that gonzo-inspired first person journalism like that of Joe Sacco is foremost on a lot of people's mind when comics and journalism are together. ...It seems to me that there is a warrant between the writer and the reader that the writer is doing his best to deliver the reader the world as the writer experienced it, and parenthetically, the more distinctive the voice, the clearer it is to the reader that it is one person’s take on things. In my class, I insist on an “I” voice. And it doesn’t even have to use the word “I,” but it has to be so distinctive that it is clear to me that it is just one person’s modest take on the world: their best take. Let’s be clear on my standards. At the top of my standards are fairness, accuracy, creating something that’s true to life — all of that are very high on my standards. I’m just claiming that it’s impossible to go out there as if you’re going to laminate the world, as if you’re going to take a Xerox machine and put it up to the face of reality and deliver it to your readers. That’s ridiculous. Everything, everything is selection, is shading, is trying to figure out what order things should go in and so forth, is imputing significance to a whole series of granular facts and so forth. That happens all the time. And the people who I cherish are people who can tell me stories that illuminate the world for me in an accurate way. And nothing that I have described detracts from that. Weschler is a fantastic writer and journalist, and he makes me reconsider the rules I set out in the submissions page about the first person. The whole thing about journalists avoiding "I" seems valuable to me because I see it as representing modesty and showing that an attempt has been made towards objectivity. However, I now see the humility in admitting that you, the author, are the responsible party. Still, in comics, the author's subjectivity is inherent in every mark on the page and perhaps more visible than in any other medium. More to think about. Here's another interesting Weschler interview if you're interested.